Humboldt County has a strong track record of reaching out to its constituents to hear their viewpoints on budget priorities. There’s a good reason the county is proactive in its public engagement. In a county covering nearly 4,000 square miles – much of it mountainous and rural – you can’t expect many residents to appear at county budget hearings to speak their mind for a couple of minutes. If you really want to hear what your residents are thinking, you need to go to them. And that’s exactly what Humboldt County has been doing through their budget roadshows. When Humboldt began receiving cannabis tax revenue for the first time in 2017, county staff wanted to hear from residents on ways that revenue could be spent, as well as their sentiments about county government in general. The challenge was developing a format that encourages public participation in a manner that allowed constituents to be heard. Formal speeches and PowerPoint presentations needed to take a back seat to in-person discussions; these meetings had to be interactive, informal, personable – and accessible. The answer was a traveling evening workshop – branded as the Humboldt County Budget Roadshow — that stopped in population centers as well as the far-reaches of the County. After a short talk on global issues facing the county, small table-top discussions were held. Residents had an opportunity to meet with department heads, staff and even elected officials. They were provided a casual forum to ask questions and voice their concerns. Attendees were also able to vote on spending priorities. And for those residents unable to attend, a short video posted online summarized the meetings, and online voting was available. The Budget Roadshow “brought local government closer to the community — letting people be more involved in how your community is run,” explained Supervisor Virginia Bass. In Humboldt County, that distance is closing. 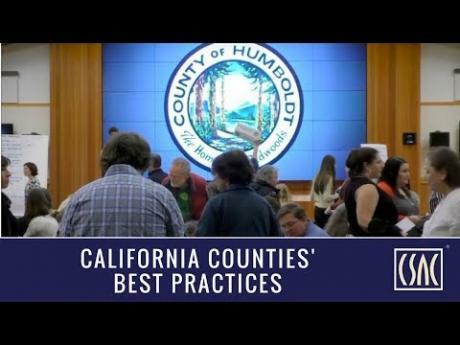 This Humboldt County program is a recipient of a 2017 CSAC Challenge Award, which spotlights the most innovative programs in county government. David Liebler is the Director of Public Affairs & Member Services for the California State Association of Counties.